The BEAN: Buzzing on the Buzz Panels and a THANK YOU!!! I am pleased to announce the BEA’s Buzz panels for this year. If you don’t know what the Buzz Panels are: BEA’s original and ultimate taste making event. Insightful and passionate, this intimate editorial exchange will provide you with an editor’s perspective on the Fall’s biggest potential breakout releases. I need to acknowledge the brilliant and dedicated group that combed through the submissions to deliver two great panels. Their depth of knowledge and insight reminds me how lucky I am to have volunteers of this caliber pour their passion and knowledge into BEA, which help make it the great event it is for all of publishing. Thank you to everyone that contributed to my participation in St. Baldrick's - I was able to raise $160.00 and take part in a wonderful event. 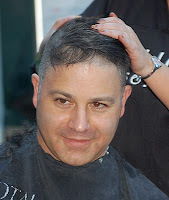 Team Brent shaved 531 heads that day and raised (drum roll) over $500,000.00!!!! Below are photos with Josh, ME & my nephew John Michael McMillan baring our heads.